Gently set NAO in a crouching position to ensure stability. Plug the charger to the mains, and plug the charger cable into NAO‘s back. Check the charger’s LED to have an indication about charge status. For further details about the meaning of LED colors, see the paper documentation delivered with the charger, or the summary printed on the charger. 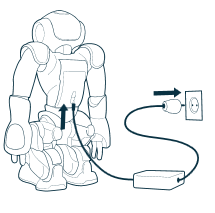 When the battery is charged enough, disconnect the charger cable from NAO‘s back, then disconnect the charger from the mains. Notifications warn you that the battery needs to be recharged. For further details, see: Battery - notifications.